Marshall Shore steeps himself in the history of Phoenix that others might overlook: the cultural anomalies, the fads, the dreamers, the artists and the eccentrics that provide a unique window into our city’s past. 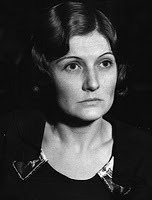 One such character was the infamous Phoenix trunk murderer, Winnie Ruth Judd. Back in 1931, the nation was rocked by the grisly details of this gruesome crime. On October 16, 1931, Winnie purportedly killed her two roommates, one of the bodies was cut up, both were stuffed into trunks, and taken by train to Los Angeles. It was a big job for a small woman, and the twisted tale of adultery, jealousy and murder was complicated by rumors, speculation and uncertainty. Bits and pieces of the story continue to come to light, even to this day. Saturday, Oct 12th, in true Marshall Shore style, he’s hosting a bus tour covering the historical crime. The tour runs from 1:30 pm to 3:30 pm, and begins and ends The Clarendon Hotel. The bus will travel along the old Brill trolley line, which will give tour-goers an idea of the shape and size of Phoenix back in Winnie’s day. Other stops will include the houses where she lived and where she met Jack Holleran, a well-known Phoenix businessman with whom she had an adulterous affair; the Grunow Clinic (still a medical clinic!) where she worked; the house where the murders took place; the train station where she attempted to board with the oozing trunks; and the old Maricopa County Courthouse where the trial took place. Where: Bus leaves from the Clarendon Hotel at 401 W. Clarendon, Phoenix. the hidden history of these sites. Also, had the opportunity to meet another performer, Vonda Kay Van Dyke, Miss America 1965, who worked at Legend City as a ventriloquist, that was also her talent in the famous beauty pageant. Celebrating and watching the found video makes me wish I could go there and cool off. Here's to Legend City and hoping you cancan keeping cool. 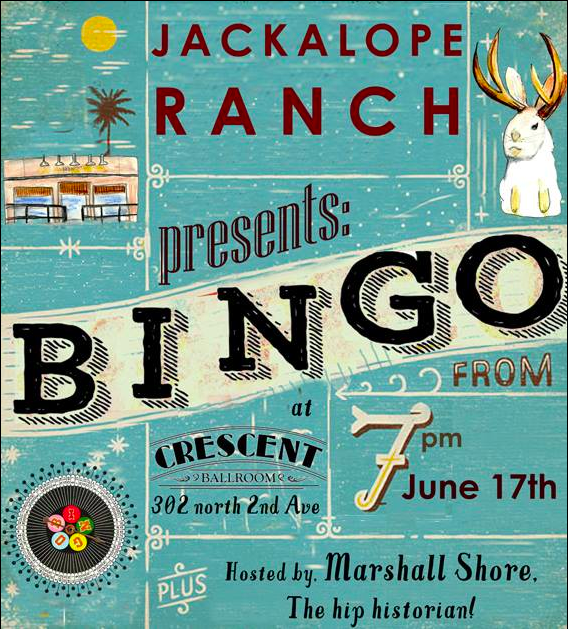 What great night of BINGO at the Crescent Ballroom sponsored by Jackalope Ranch and hosted by The Hip Historian, Marshall Shore and Jenny as my uumm... straight man and ball girl (I know you wish you had one.) 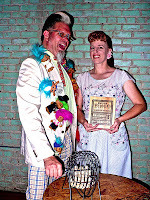 Fabulous prizes were won and everybody had a blast! There are already plans for another round in Aug. Stay tuned for more details! B-I-N-G-O. 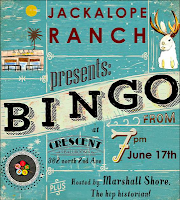 Phoenix New Times culture blog Jackalope Ranch presents an evening of free bingo in the Lounge at Crescent Ballroom starting at 7 p.m. Monday, June 17. 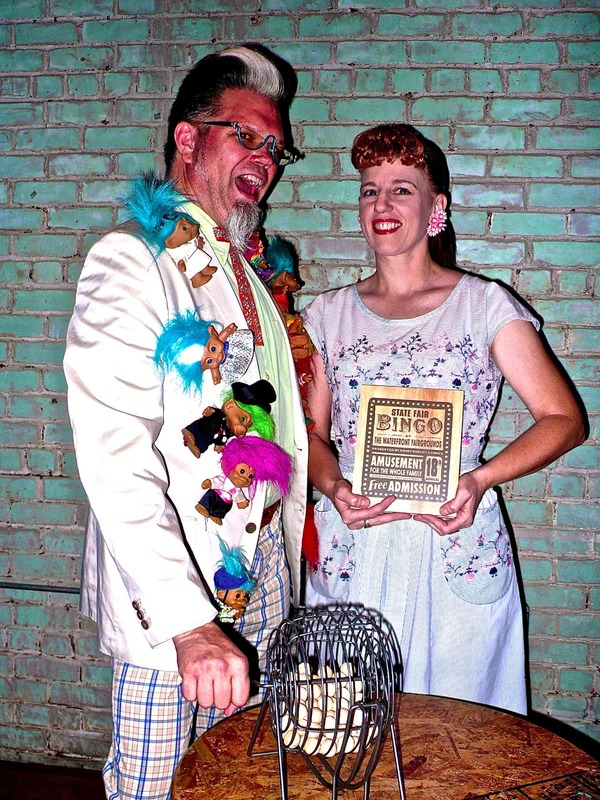 Arizona's resident Hip Historian Marshall Shore emcees the game night, complete with custom bingo cards by Phoenix artist Sarah Hurwitz. Yep, you read that correctly! 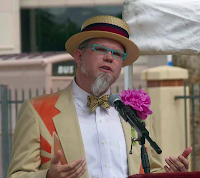 Hip Historian, Marshall Shore will present a program on Route 66 during this week’s Arizona Historic Preservation Conference: “Making Preservation Relevant” at Hilton Mesa East on Wednesday, June 13. On-site registration is available. Marshall Shore, Arizona’s Hip Historian will present an insider’s look at the Arizona section of Route 66. He’ll share the history of America’s most iconic highway through a look at its place in pop culture and images of some of the famous sites along the way, including both the ruins and the preservation successes. This program was created for the celebration of Grapes of Wrath as part of the Big Read/ One Book Arizona. 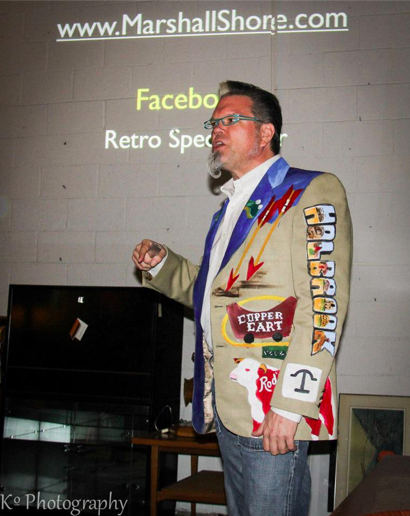 The multi-media presentation includes music, video clips, still photos, and storytelling magic by Marshall Shore wearing a one-of-a-kind Route 66 suit coat hand-painted by Phoenix artist Hugo Medina. Why the big peony on my lapel? It was part of my costume for a keynote presentation at the Pioneer Cemetery 30th annual Memorial Day observance. When they asked me to speak they said I could dress vintage, so I donned a snappy boater hat and my Arizona jacket, but the outfit needed a little extra something to make it pop. Perhaps a big flower? A poppy? An iris? My Mom reminded me that in Indiana we would clip peonies from our backyard and take them to grave sites. I happened to be at a local cafe and noticed they had peony bouquets on the tables, so I took it as a sign and borrowed one. While researching Memorial Day, I'd learned that it was originally called Decoration Day and the date was chosen because it was when the most flowers would be in bloom across the nation. That peony was just what I needed. I was honored to speak amongst so much history and happy that I was able to personalize the experience with a nod to my own history by wearing the peony on my lapel.